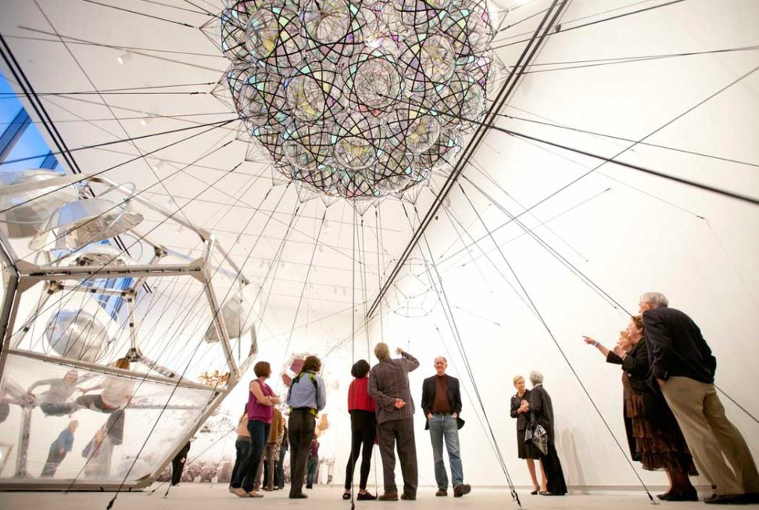 The Baltimore Museum of Art (BMA) has commissioned a major new work by internationally acclaimed artist Tomás Saraceno for an exhibition that has transformed the visitor experience of the museum. 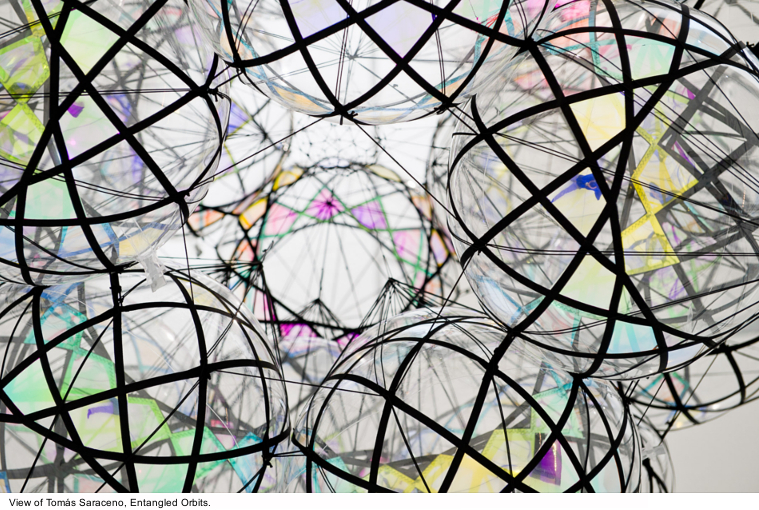 Tomás Saraceno: Entangled Orbits brings together a group of fascinating sculptural works by the Argentinian artist and trained architect who draws inspiration from structures of the natural world—clouds, bubbles, and spider webs. 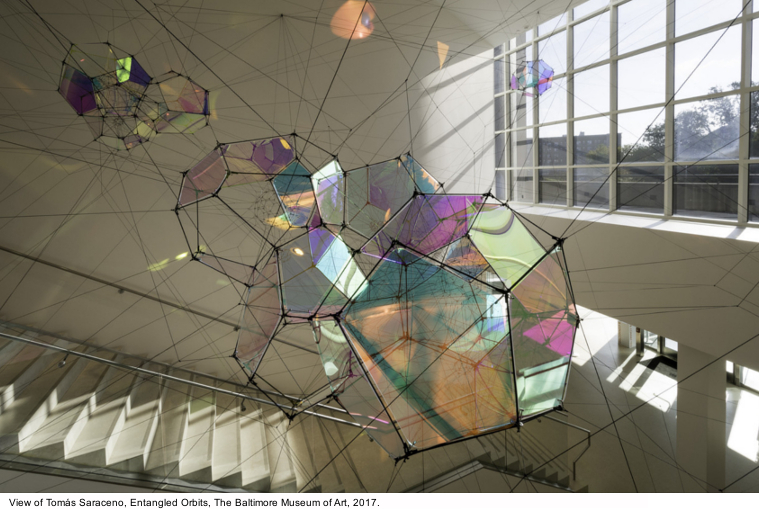 The centerpiece of the exhibition is Entangled Orbits, which combines clusters of iridescent-paneled modules suspended within a net of strings reminiscent of a spider web that was woven on-site across a two-story open area in the East Lobby. This work is accompanied by three installations in the European Art galleries: an elaborate sculptural spider web made by two species of spiders and encased in a dramatically lit suspended vitrine, abstract sculptures that recall planetary systems and early 20th century modernist design, and a complex installation of suspended iridescent inflatables anchored with a web of strings that visitors navigate through in the gallery. “Tomás Saraceno, his studio team, and an expert group from the BMA have spent many hours developing a highly complex and fascinating series of installations that has transformed a number of the museum’s spaces in thoroughly unexpected ways,” said BMA Senior Curator of Contemporary Art Kristen Hileman. 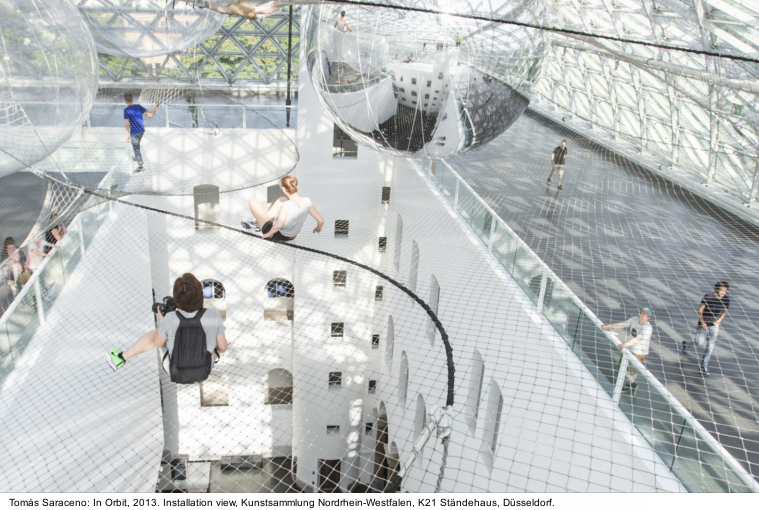 “The result is sculptural environments that immerse visitors in a magical combination of art, architecture, and science.” Tomás Saraceno: Entangled Orbits is sponsored by the Richard C. von Hess Foundation. Additional support is provided by Joanne Gold and Andrew Stern. Berlin-based artist Tomás Saraceno (b. 1973, Argentina) takes inspiration in the adaptability, integrity, and beauty of such natural formations as molecular chains, clouds, and spider webs. He creates drawings, sculptures, and site-specific installations that apply these natural structures to the problem of developing alternative constructions for living that would enable humans to more responsively and responsibly inhabit the planet. Although grounded in science and observation, Saraceno’s vision is expansive, including a strong sense of aesthetics and an openness to utopian solutions. His work has been exhibited at The Metropolitan Museum of Art; the Grand Palais, Paris; the NTU Centre for Contemporary Art Singapore; and many other venues around the world. The artist has participated in the International Space Studies Program at NASA’s Ames Research Center and held residencies at Centre National d’Études Spatiales in Paris and MIT’s Center for Art, Science & Technology. In 2009, he presented a major installation at the 53rd Venice Biennale and was awarded the prestigious Calder Prize. Founded in 1914, The Baltimore Museum of Art is a major cultural destination recognized for engaging diverse audiences through dynamic exhibitions and innovative educational and community outreach programs. The BMA’s internationally renowned collection of 95,000 objects encompasses more than 1,000 works by Henri Matisse anchored by the famed Cone Collection of modern art, as well as one of the nation’s finest holdings of prints, drawings, and photographs. The galleries showcase an exceptional collection of art from Africa; important works by established and emerging contemporary artists; outstanding European and American paintings, sculpture, and decorative arts; significant artworks from China; ancient Antioch mosaics; and exquisite textiles from around the world. The 210,000-square-foot museum is also distinguished by a grand historic building designed in the 1920s by renowned American architect John Russell Pope and two beautifully landscaped gardens featuring an array of 20th-century sculpture. The BMA is located in Charles Village, three miles north of the Inner Harbor, and is adjacent to the main campus of Johns Hopkins University. General admission to the BMA is free so that everyone can enjoy the power of art.